Resizing images has always been a daunting task for me, especially when I have tons of images to resize. Of course there are many good free tools that do batch resizing, but those still require some manual steps. But thanks to Dropresize (Windows), resizing images is now easier than ever. 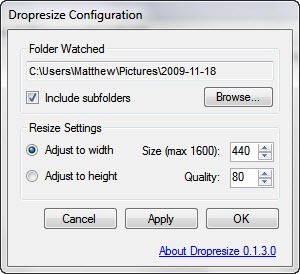 Using Dropresize, you might not even know you have resized any images because all the processes are done automagically. Dropresize is a small app that runs on the system tray. It watches a folder (defined by you) for new images and automatically resizes them into the size you want. So, what you need to do is to â€œdropâ€ any images into the folder and Dropresize will do the rest. Note: Dropresize is currently still in beta and it only supports jpeg image file at the moment. Dropresize works well in Windows 7 (as well as Windows XP and Vista) and requires Microsoft .NET Framework 2.0 or later. Try Dropresize now. Get it here.